Ocean container carriers are significantly boosting cargo capacity on Asia-Europe shipping lanes for the first time in 18 months, threatening to reverse recent strong gains in freight rates. New service launches will add around 22,000 20-foot equivalent units to the trade, representing around 7 per cent of total capacity, according to Alphaliner, the Paris-based consultancy. 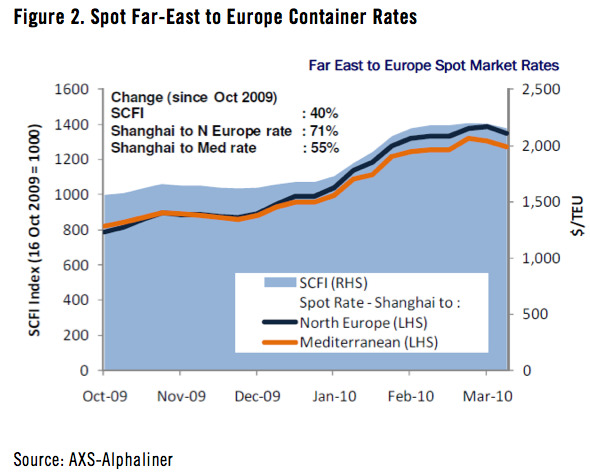 “This is the first major influx of capacity onto the Asia-Europe sector since the start of the financial crisis in September 2008,” Alphaliner said. The additional services will ease the capacity crunch on the Far East-Europe market, which the trade has faced since late December. Europe may look like it is ‘dying’, but they’re still voraciously consuming Asian goods.